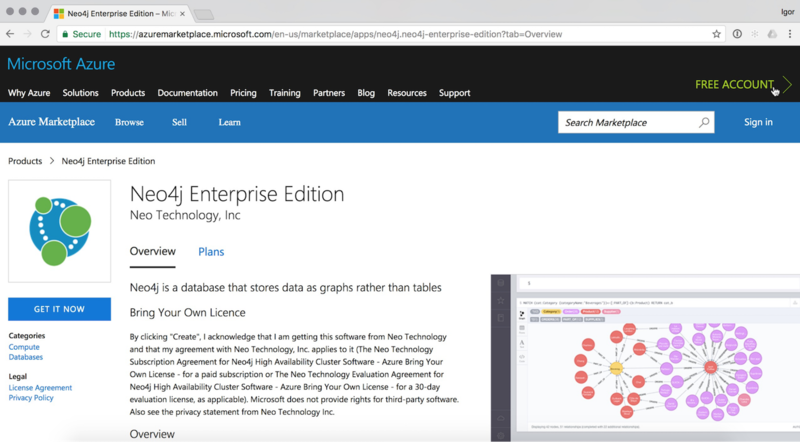 We are excited to announce the availability of Neo4j in the Microsoft Azure Marketplace. Neo4j is a native graph database that stores data as graphs rather than in tables so you can traverse any depth of data in real time and get your queries executed in milliseconds instead of minutes (or hours!). Using the combined power of the world’s leading graph database (that’s Neo4j) and the flexibility and scale of Microsoft’s trusted cloud platform, organizations can transform the way they approach and extract the value from their data. As systems and processes become increasingly interconnected, organizations need to understand and leverage cross-domain intelligence. Neo4j’s native graph database is designed from the ground up to efficiently find and employ data relationships. This ability, coupled with the adaptive scale of Microsoft Azure, enables organizations to address today’s evolving data challenges with a level of speed and agility not previously possible. Neo4j in the Azure Marketplace is an ideal option for organizations embracing the public cloud, that need a highly scalable way to deliver constant, real-time performance. With this integrated Neo4j and Azure solution, enterprises can build intelligent applications to meet today’s dynamic business needs in areas of graph-based search, fraud detection, recommendation engines, identify and access management, network and IT management, master data management and other use cases. For more information on typical use cases and solutions, see the Neo4j Solutions page. 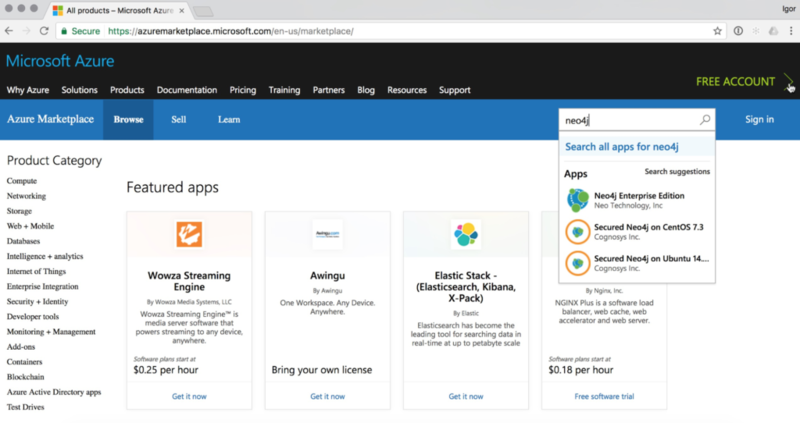 You can get started with Neo4j in Azure today by provisioning the pre-built template called “a href=”https://azuremarketplace.microsoft.com/en-us/marketplace/apps/neo4j.neo4j-enterprise-edition?tab=Overview” target=”_blank”>Neo4j High Availability Cluster“. With the Neo4j High Availability Cluster Template in the Azure Marketplace, you can quickly and easily deploy a graph environment to test it and determine if it’s right for you. Neo4j requires a paid subscription (Bring Your Own License), however a 30-day evaluation license is incorporated into the setup process for your convenience. If you are new to graphs, it is highly recommended that you engage us to learn more about how to make graphs sing, including how to transition from the relational database world to graphs. There are many resources to explore: join our public Slack group, follow Neo4j on Stack Overflow, or check out our YouTube channel. Want to learn how relational databases compare to their graph counterparts? Download this ebook, The Definitive Guide to Graph Databases for the RDBMS Developer, and discover when and how to use graphs in conjunction with your relational database. I’m considering the option to deploy mi Neo4j solution to Azure. 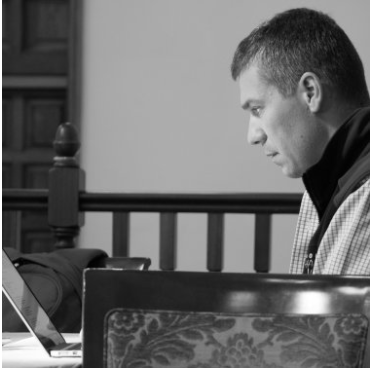 Some questions come to mi mind: How can I update a version of Neo3j in Azure? Using this Azure template, Will I can get the latest Neo4j upgrades/updates?